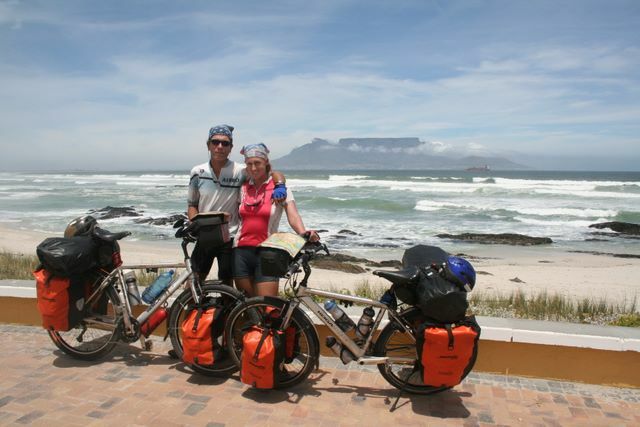 About GoBicycleTouring – Go Bicycle Touring! 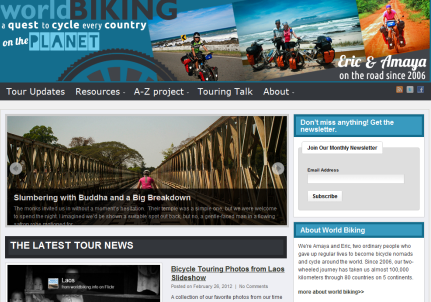 Our mission is to help you find bicycle touring blogs and resources that will entertain and inspire you. We’re glad you’re here. As long-distance bicycle touring becomes more popular, there are an increasing number of bicycle touring blogs flooding the internet. Finding the very best bicycle touring sites can be difficult. That’s why we founded GoBicycleTouring.info. We profile the very best bicycle touring blogs so you can find the right site without spending hours surfing the internet. We’re always looking for new bicycle touring blogs to feature, so if you’ve got a site to suggest please contact us. Posing in front of Table Mountain to celebrate our arrival in Cape Town after a long slog through Africa. We’re Amaya Williams and Eric Schambion, two regular people who have become addicted to bicycle touring. This is our 5th year on the road, and we have no plans to stop. You can join us on our world tour by following our updates on WorldBiking.info.